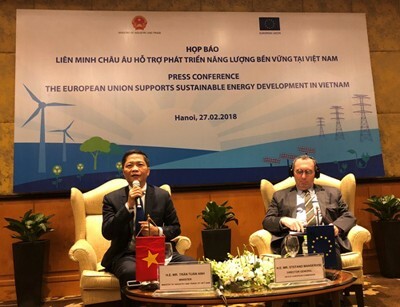 The European Commission (EC) announced a component on the EU’s technical assistance to Viet Nam’s energy sector, worth €108 million for Viet Nam on February 27 in Ha Noi. The technical assistance is to serve the implementation of a €108 million program under which the EU will help Viet Nam’s rural areas access sustainable energy. The program is aimed at enhancing rural areas’ ability to sustainable energy and making contribution to building a more sustainable energy sector in Viet Nam by promoting the efficiency of clean and renewable energy sources among the public. The program is expected to help the Vietnamese Government fulfill the target of providing electricity for 1.2 million rural households from 2013-2020 and enhance State management in the energy sector to facilitate the country’s transition towards a more sustainable energy sector, said EC’s Director General for International Cooperation and Development Stefano Manservisi. MoIT Minister Tran Tuan Anh said Viet Nam needs to invest about 5-7 billion USD each year in the energy sector, affirming that the Vietnamese Government welcomes the support of the EU in this field. Once the program is completed, about 750 villages with about 60,000 households, an island district and two island communes are expected to access electricity. The component, co-sponsored by the EU and the German Ministry for Economic Cooperation and Development, will be carried out by the German Development Cooperation Agency (GIZ) in conjunction with the MoIT.